I like history, and I like libraries. This book has been on my radar since 2008, when it was reviewed at Bookwyrme's Lair. Just that brief little blurb rocketed this book onto my list, because: history, libraries. Yes. It's not a very long book. The page count includes several pages of notes and an index. The writing is mostly quite readable if sometimes (infrequently) a little stilted in the way of academic writing. The descriptions are often evocative enough that with the accompanying (grainy, black and white) pictures, I can visualize what an ancient Roman or Greek library might have looked like. I can picture the people, the books, the spaces. Clay tablet of Ashurbanipal, King of the World, King of Assyria, who trusts in Ashur and Ninlil. Your lordship is without equal, Ashur, King of the Gods! Whoever removes [the tablet], writes his name in place of my name, may Ashur and Ninlil, angered and grim, cast him down, erase his name, his seed, in the land. He who breaks this tablet or puts it in water or rubs it until you cannot recognize it [and] cannot make it be understood, may Ashur, Sin, Shamash, Adad and Ishtar, Bel, Nergal, Ishtar of Nineveh, Ishtar of Arbela, Ishtar of Bit Kidmurri, the gods of heaven and earth and the gods of Assyria, may all these curse him with a curse which cannot be relieved, terrible and merciless, as long as he lives, may they let his name, his seed, be carried off from the land, may they put his flesh in a dog's mouth! You can bet that put the fear of the gods in some careless library patron. It's a good reminder that there really is nothing new under the sun. Actually, that said, the public library as we might recognize it was really an invention of the Greeks, quite some time after Ashurbanipal was cursing the seed out of the rascals who stole and desecrated his private books. And though Casson works his way through the Assyrians and slightly before all the way through to the beginning of the Middle Ages, the bulk of his time is spent showing us Greek and Roman libraries, both private and public. This is, one realizes, because that's where a lot of the evidence is -- earlier and there's not a lot to go on, later and we're out of the Ancient period Casson is investigating. Which leads me to two things: the first is that this is a great book that investigates one aspect of a culture I know less about than I wish I did. My study of Greek culture is... extremely limited to say the least, and my study of Roman culture is limited to a Grade 10 Latin class. I took a Classics course in first year uni, but there we mostly looked at mythology, not culture (to the extent that it can be separated, which is actually quite a bit.) Therefore, I think this book will be a good re-read once I've done a bit more investigating into those cultures. I'm particularly taken with the pre-Greek cultures. I got a lot out of this little book, but I think I would have gotten even more if I had a better depth of knowledge of the time periods and cultures covered. The second is that the cultures covered are Western precursors, which is of course the tradition in which I stand here today. I would love to read something similar about Eastern precursors. Well, to be honest, I would probably do well to read something about contemporary Eastern libraries. I don't even know if there is such a thing, though I assume there must be something like what we have here. Anyone have any suggested readings for me? 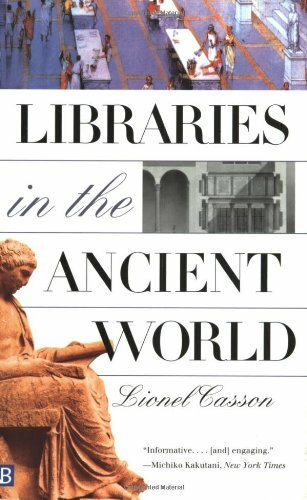 Overall, I highly recommend this book for anyone interested in libraries, or anyone interested in the history of books or reading or literature in ancient Western cultures. Anyone who knows ancient Greek and/or Roman will find this an interesting addition and in-depth investigation into one aspect of those cultures, too. Extremely fascinating, generally well-written, and I'm very glad fishy was able to find it for me. You're making me want to reread it. I don't remember enough from it! Also, now you're starting me wondering what other books there are about libraries and if they're any good. There must be others, if just because of the fact that most North American universities require their librarians to be on the tenure track now. So those librarians have to be publishing something, and some of them must be as curious and excited about the history of libraries as I am... if/when I find something, I'll let you know! Ooh, you had me at the TITLE. I would LOVE this book, I think!! Amazing how catchy that title is, isn't it? I thought the same thing when I first saw it!